Thank you, I had not seen that. I was also wondering about having all the battens parallel like that, but I thought it might be hard to arrange the yard high enough on Tammy. I’ll write to Chris. Additional requirement: capability to heave to in any weather below force 8. What do you think? I don’t really believe in the junk sloop “heave to”. 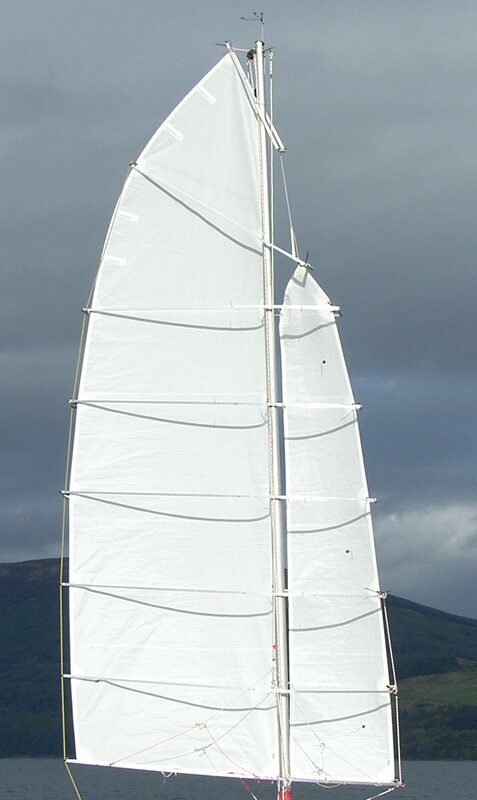 Unlike the Bermudan, there no dynamic balance between the sails and rudder that keeps the boat in position. At least, I’ve not found one! What we lose there we gain in reefing ability. When I was stuck off Wells-next-the-Sea in the remnants of Hurricane Bertha, desperate for sleep, with no windvane, I pulled the sail in tight and used a bungee on the tiller to keep Tammy just off the wind. She made about 2kt at 90° to the wind and that allowed me to rest. Almost as good as a bermudan heave-to. I used a sheet to tiller arrangement yesterday. Worked pretty good hard on the wind. 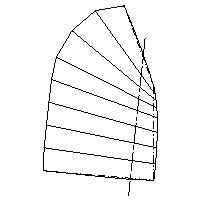 I’ll try oversheeting with that line and securing the helm in the lee. See what happens. 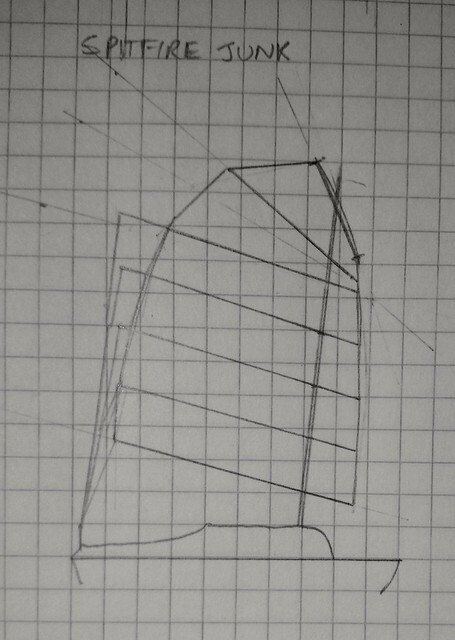 Regarding the balance problems: I’m thinking about moving the engine to the stern and closing the gap in the bottom. That should balance things out and then the new sail resolve the remainder of our problem. I haven’t done proper experiments with the engine lifted, but I was sailing around without the engine for a while earlier this year and didn’t notice any difference. I’m not convinced it is significant. Sail shape is the key I think. I’ll be very interested if you go with the aero junk design. Perhaps I can visit and help construct it. Yes, that might be so. It’s on my (long) list to make a cover for the hole and see what difference it makes. Even a board held with duct tape for a day would be a good experiment. Currently I’m sailing to the kinselmeer on the starboard tag with 45 degrees of rudder in put. With the breaks on so to speak. This has to end. At least you are sailing! I am stuck at home. Have fun! Maybe start same drawings for the aerorig. Widest part of the wishbote has to be at least 15 cm to clear the top of the most drop installation / sleeve. Would help me a lot.